Diabetes is a manageable disease, but it can make life more challenging for aging adults. These challenges alter quality of life and decrease longevity. It’s important to take every step you can to prevent your aging loved one from developing diabetes. Here are some tips to lower the risk of diabetes in the senior years. Green, leafy vegetables are high in fiber and low in calories, and they can steady your loved one’s blood sugar, keeping him or her feeling full. Kale, spinach, broccoli, and collards are the ideal vegetables for seniors due to their high concentration of vitamin C and polyphenols. The antioxidants in the vegetables can also fight against oxidative stress that causes diabetes. Green, leafy vegetables contain magnesium, which helps the muscles relax, allowing insulin resistance to go down. If your elderly loved one is living with a serious medical condition and needs help managing the tasks of daily living, reach out to Home Care Assistance, a Huntington home care agency you can trust. Our caregivers are available 24/7, there are no hidden fees in our contracts, and we offer a 100% satisfaction guarantee on all of our in-home care services. Avoiding dairy products can be challenging for older adults, but fat-free dairy is a good alternative. High-fat dairy products can increase blood sugar and lead to insulin resistance. Encourage your loved one to eat high-quality proteins such as low-fat or fat-free cheeses, low-fat milk, egg whites, and unsweetened yogurts to lose weight and lower blood sugar levels. Your loved one should remember to eat dairy in moderation. Too much dairy could cause weight gain and increase the odds of developing diabetes. 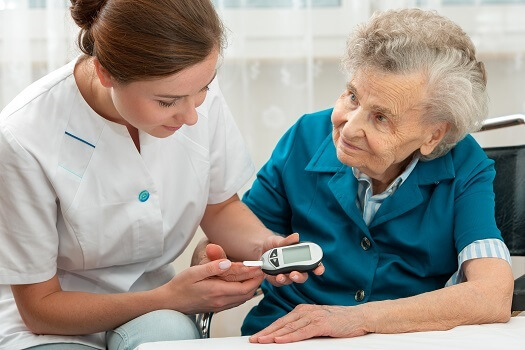 Caring for an older adult with diabetes can be challenging. If you are the primary caregiver for a senior loved one in Huntington, respite care is available when you need time away from your important caregiving duties. At Home Care Assistance, our respite caregivers are available 24 hours a day, 7 days a week to help your loved one manage everyday tasks in the comfort of home while you have the chance to take a much-needed break. One of the top risk factors associated with diabetes is chronic stress. It’s important for your loved one to understand which foods increase his or her stress levels and avoid those items. Breads, candies, cakes, artificial sweeteners, and processed carbohydrates are the worst foods for seniors because they are packed with sugar and sodium. Instead of eating these foods, your loved one should eat high-fiber breads and snacks made from whole grains, as well as nuts, unsweetened teas, and caffeine-free products. Your loved one should also eat whole carbohydrates such as potatoes, whole fruit, and legumes. Avoiding beverages and foods full of sugar, caffeine, and sodium can prevent the release of several stress hormones that increase blood sugar. If your senior loved one needs help managing an illness or assistance with daily tasks, make sure you choose a top-rated provider of elderly home care. Huntington Home Care Assistance is here to help your loved one live a happier and healthier life in the golden years. From the mentally stimulating activities in our Cognitive Therapeutics Method to our friendly Care Managers who are available to answer your questions 24 hours a day, we offer a wide array of high-quality at-home care services. Call one of our friendly Care Managers at (304) 521-2909 to learn about our comprehensive elderly care plans.